Here is a unique tea time snack made with Ragi, Soya, and wheat stuffed with veggies your family would love to eat. Add curry leaves and fry over medium flame. When they turn light brown, add fennel seeds and pepper. Reduce flame to the lowest; add ginger paste, garlic paste, green chili, and sauté over medium flame for 3 minutes. Add turmeric powder and sauté for a few seconds. Add onion and sauté over medium flame till soft. Add cabbage, carrot, and bean sprouts and sauté for 3 minutes. Add soya granules and garam masala and mix well. Sauté for a few seconds, sprinkle coriander leaves. Remove and keep aside. Sieve together ragi and wheat flour. Using enough water and salt, make the dough. Allow the dough to rest for 15 minutes. Divide the dough into smaller portions and roll out each smaller portion into a thin circular sheet. Fill the stuffing in these thin sheets, then fold the edges to form the momos. Seal the edges well and steam for about 10-12 minutes. 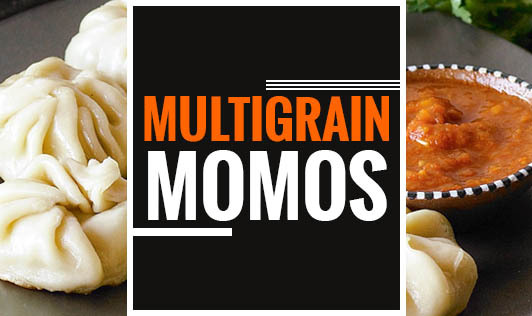 Serve these hot multigrain momos with any sauce of your choice.